Expletives were heard the last time I served this. The phrase ‘your new crack‘ as well. And while it is a breakfast dish, you can have it any time of day. I certainly do. It’s a killer late night dish, for instance, after an extra long day at work or, well, whatever you’ve been doing late night. I give you my Skillet Chilaquiles, a bastardized, easy version of the traditional Mexican breakfast. True chilaquiles are tortillas sautéed in a spicy red or green sauce, often with shredded chicken mixed in. Fried eggs sometimes are served on top. Given my obsession with eggs, it’s no wonder I devised this version over the years using eggs as the actual sauce. 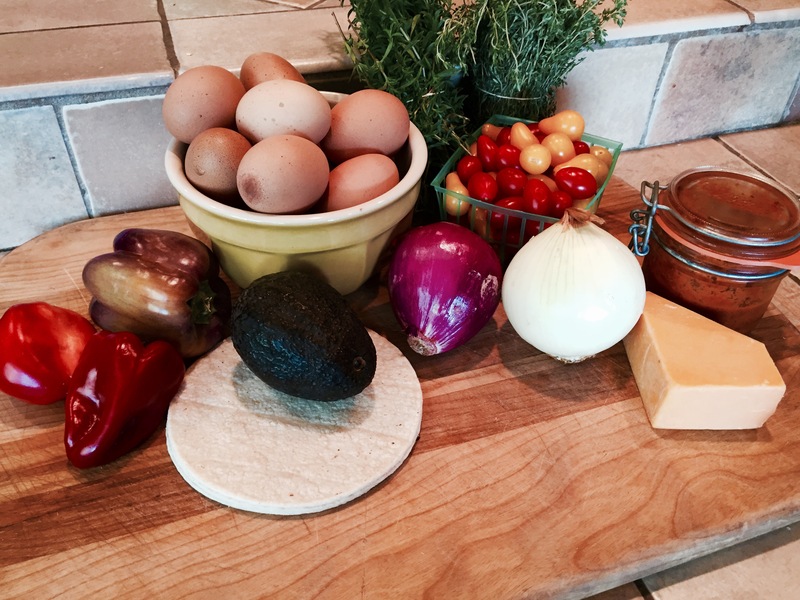 What you end up with are tortillas, still a bit crispy, coasted with a luscious sheen of eggs, cheese and chilis. Try it once and, like me, you will start keeping all the ingredients on hand. As readers of the blog know, I have a more than a few obsessions, chicken being one of them. It follows that eggs are also an obsession. I eat eggs virtually every morning. Along with coffee, there is no better way to start your day. 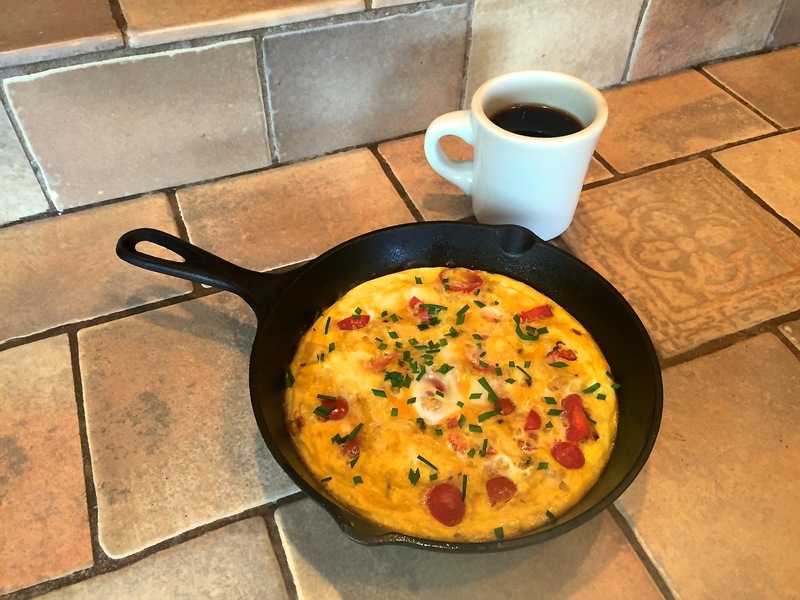 Let me then give you one of my favorite breakfasts, a dish I make at least twice a week if not more: a baked omelette. Is this a quiche, you might ask. No, it’s not a quiche. I know that real men eat quiche but I’ve never been a huge fan of quiche. A baked omelette is excellent, then, for people in my camp. Even if you are a fan of quiche, I trust you will love this as well. The differences? First, there is no crust. I love a good flaky crust as much as anyone but I certainly don’t have time to roll one out in the morning. A good flaky crust also isn’t the healthiest thing to eat every day. A baked omelette is lighter, healthier and easier to make. It cooks in the oven much faster than a quiche, so it has a different consistency. It may not be incredibly attractive, but when something tastes this good, who cares? A baked omelette is also very versatile. As the recipe below shows, you can incorporate all kinds of flavors into it, which means you can make it over and over and still keep it original and delicious. It’s still summertime, which means the Farmer’s Market remains filled with fruits and vegetables available only this time of year. I know, I know, we discussed this already here. But we haven’t talked Squash Blossoms, something truly unique and wonderful with which you can cook in the late summer. As any gardener will tell you, squash is one of the easier things to grow and is ridiculously bountiful. As such, during the summer people are always on the lookout for inventive ways to use squash. I love layering sautéed onions, thinly sliced tomatoes and thinly sliced zucchini, layer by layer, with lots of fresh thyme, basil, salt and pepper, for a wonderful gratin. Add in a little white wine and/or broth, cover with foil and roast in the oven on 350 for 45 – 60 min (the last 15 min uncovered) and you will end up with a fresh, healthy divine dish that is redolent of summer. Squash is also great for pickling. With squash also comes squash blossoms. For years I’ve admired these beautiful blossoms at farmer’s markets, in the store and in my own garden. But I never knew quite what to do with them so I didn’t try cooking with them. Restaurants sometimes offer squash blossoms stuffed with cheese and then fried which, when done well, is terrific. But I am not much of a deep fryer at home and the recipes I looked at were too much of a pain. I finally decided to try a few inventions with squash blossoms and ended up with two dishes I know you will love. 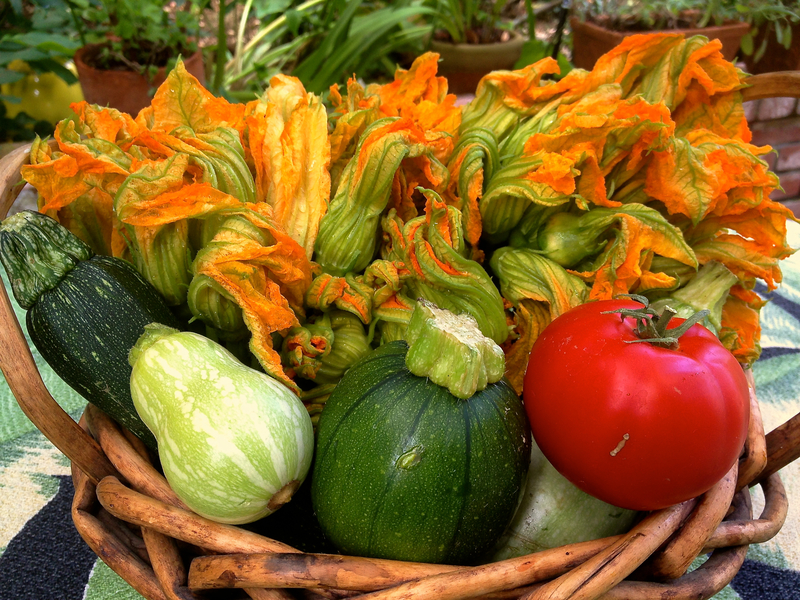 – Then add a bunch of squash blossoms, chopped. Be sure to first gently wash the blossoms. Oh and tear them open before you wash and chop them to check for, you know, a creepy crawly. It’s rare but it happens. – Saute everything down a little more until the blossoms are soft. This is a mixture I can eat by itself, with a spoon, it’s so good. Squash Blossom Quesadillas or Baked Eggs with Squash Blossoms. Both are very easy. And. To. Die. For. It may be the age-old question but for me the answer to ‘Which came first?’ is simple: The Egg. Not that I don’t love chicken. I’m obsessed with chicken, as some of you know. This obsession started early as we ate a lot of chicken when I was a child. Growing up in The South, we ate a lot of fried chicken. Mom made a killer Chicken Tetrazzini I still think of with intense fondness. We had roast chicken occasionally and, in my teen years when we were trying to get my dad to eat healthy, we ate a lot of grilled chicken. But even before my love of chicken there was The Egg. I always loved eggs. I loved them even before I remember, well, anything. My first actual memory as a child isn’t an egg but is sitting in a movie theatre. This experience lead to my career path as well as to this blog. I remember actually falling in love with movies that day. I sat in the theatre thinking, ‘Yeah, Ok, I get it, that’s amazing, I love this, that’s what I want to do.‘ But I don’t have a moment in my memory where I fell in love with eggs. I simply always was in love with them. An egg has to be one of the first items of real food Mom fed me. We had them for breakfast 4 or 5 times a week … and occasionally for supper, ‘Breakfast for dinner’!… so I fell in love with them even before that first actual memory in the movie theatre. This is a love affair that has not waned. At this point I’m beating a dead horse but, my goodness, I love eggs. An egg truly is the perfect food. Not only can you eat one on its own in so many wonderful ways, an egg is remarkably versatile. An egg can do virtually anything or go into virtually anything. Feel free to suggest a food in which you can’t use an egg but I’m hard pressed to think of what. If a dish is savory, at the very least you can top it with a fried egg, a trend that has exploded in restaurants lately. If on the other hand a dish is sweet, chances are you can still beautifully incorporate an egg, for taste, for texture, for plain old wonderful goodness. The Egg is definitely a deserted island food for me. You know the game: If you could only have 5 foods for the rest of your life to eat on a deserted island, what would you choose? The egg is at the top of my list.